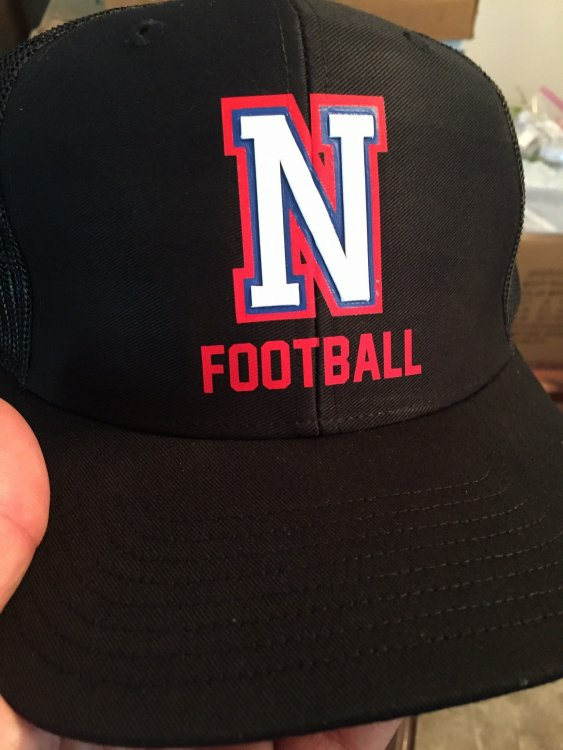 My friends company got these new hats, the logo is rubber, but its cut out like it was cut with a vinyl cutter. Does anyone know how this is done, or what material is used? I'll attach an imgur album with some pictures because it's kind of hard to explain. That looks a lot like Siser Brick. They have a few different thicknesses available although USCutter stopped carrying the 1000 micron and now just seem to have the 600. It's still a cool addition to create some extra pop. Thank you! That is exactly what it is. I've been really busy lately, so I just got around to trying out the brick. It is a tough cut. I'm going to try a new blade maybe. It seems to cut deep enough most places, but corners it seems to not be cut through enough. Yes that's the same experience I have had. Best when used for very simple shapes. Great look though although you need to put a long dwell time on the heat or it can pull back up sometimes. I may have to use a simplified version of my logo for the hats then! I appreciate your help. I'm going to practice a little bit more. I have some extra hats just in case. What kind of blade are you using? Try a 60° blade. That is what I use for cutting thick rhinestone stencil material and it works pretty well. Hey Goose. When you say simple shapes for the brick 600, just how simple do they have to be? Do you have any pic's of what you have done with it? Also, do you use the standard "skeeter" blade setting procedure? You definitely need a 60 deg blade to cut the 600 it is roughly 24 mil thick and slow the cut speed way down. I'll see if I have a pic of what I did and if so I'll post it. Here is a hat I did. The Red and Blue are regular Siser and the White is Brick. May even be Brick 1000 which USC stopped selling. 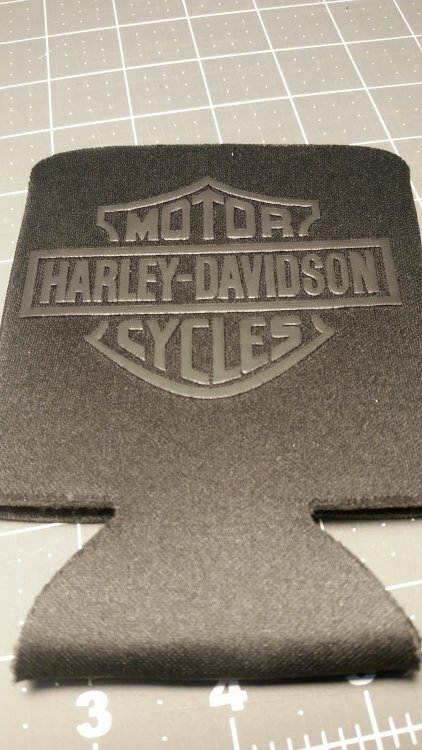 If you look close you can see the corners are not perfect part of this is from the cut and part from the length of time I had to leave it in the hat press to get good adhesion. Regular shirts you can turn inside out and heat from the back side but the hat took some effort to get it to stay put. The client loved it. Ok, thanks. I have the 60* cleancut blades in both my holders. Oh, same skeeter blade set up method? I saw that part about heating the back, but that seems to have been for the 1000 and taken out for the 600. Will give it a try and see how things go. I did the Skeeter method for blade depth yes. I don't think there is any other effective way to get there especially on something that thick. It is definitely a cool product that has a niche application here and there. I did a logo on one of my personal hoodies out of 600 to see how well it holds up and it has stayed well. Thanks. I will find out in a couple of days. @MZ SKEETER You're a method!! Immortalized for the eternity of the forum! Woohoo! Yup, the "Skeeter method" When Dakota writes his book detailing the life and times of the us cutter forum, it better have it's own chapter. Before you remind me, I know. Not for sale. When I get a new product to try, I always make something for me first to test the stuff out.. The stuff is like cutting and weeding vinyl flooring. Maybe not that bad, but wow. Also, the carrier is not sticky. If you pull any part of the design off. It will not stick and you have to put that piece on with a second pressing. Very cool effect. The black on black looks amazing. 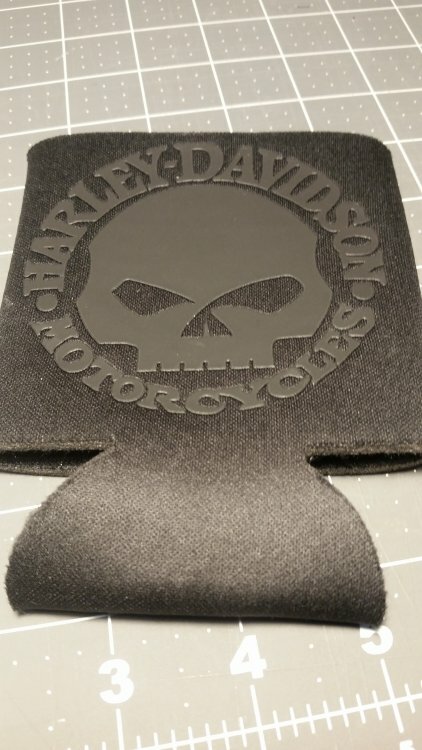 Pic's are one koozie with design on both sides. Now to test it and make sure the stuff sticks. Hmm seems like seems like I might have tested mine with a certain well known gun makers mark.... All I can say is my kids wear cool stuff and so do I. Agree the weed is no fun and I wish it had a sticky carrier. Ya, that sticky part is needed. Must be a reason for it not being there. Same with my kid, coolest stuff around.